Garlic, October Is the Time to Plant! It's almost time to plant garlic. There are a lot of decisions to be made when choosing garlic. Hardneck or softneck? Many cloves or just a few? Mild or spicy? 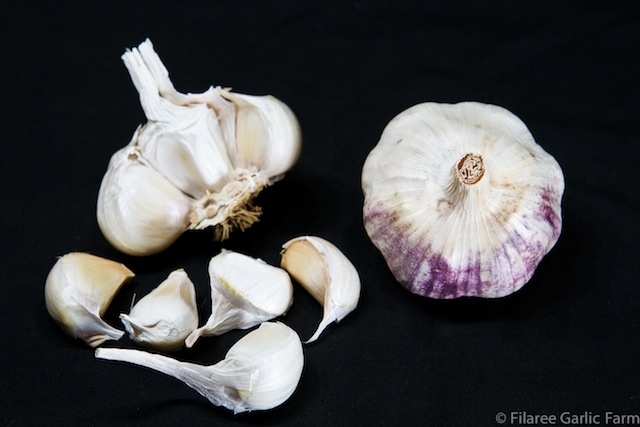 Comparing all the features of each variety can be a daunting task, but with a little time and access to the internet, anyone can learn enough to choose the garlic types that are right for them. 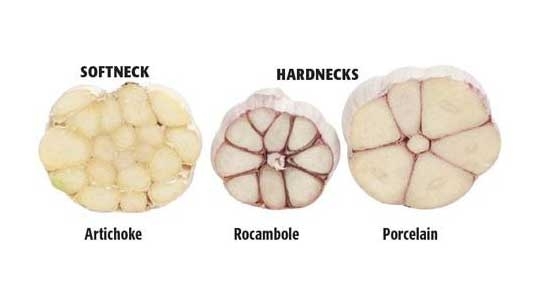 There are two main types of garlic: hardneck and softneck. 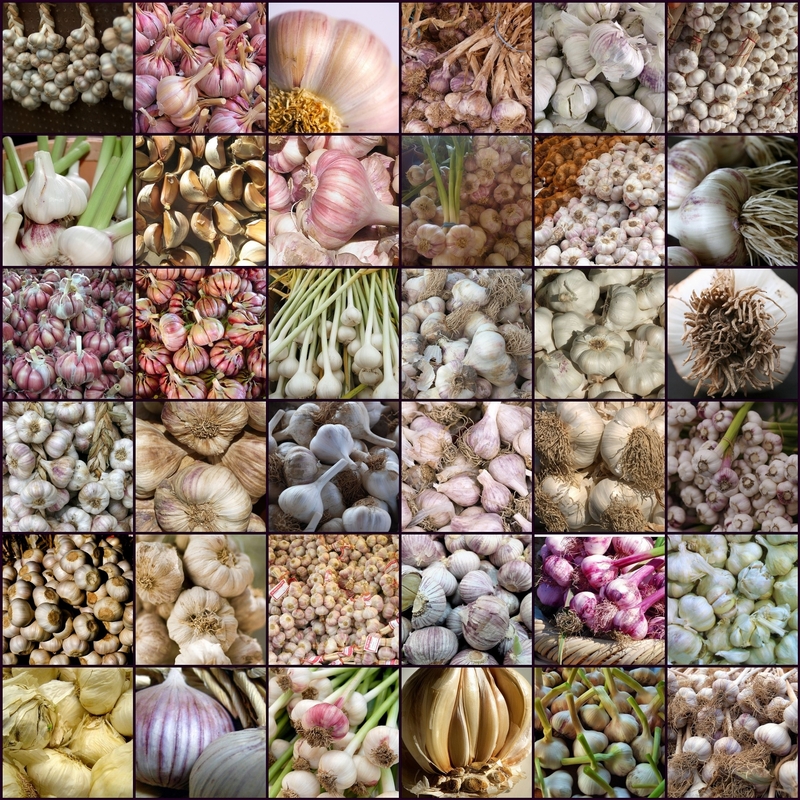 Each garlic variety is designated as one type or the other based on its tendency to develop flower stalks, its hardiness, and its clove formation pattern. Hardneck varieties develop a long flowering stem called a scape. Under ground is a single row of cloves wrapped together in a papery sheath to form the bulb. 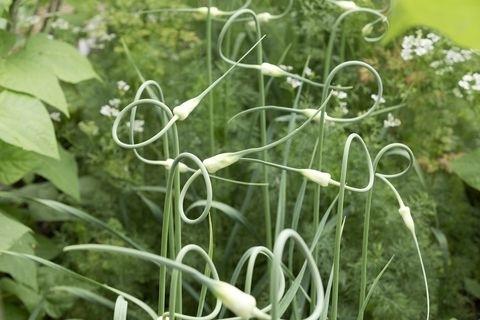 Scapes should be cut from hardneck garlic plants in early summer as they can rob energy from the plant and result in smaller garlic heads. Hardneck varieties yield cloves that are easier to peel and more flavorful than softnecks, and hardnecks have fewer but larger cloves per bulb. Hardneck varieties do not store as well as softnecks. They can begin to deteriorate and shrivel within four to six months of harvest. Softnecks are best for warmer climates as they're not generally as hardy. They store well and will last for nine to twelve months under ideal conditions. Softneck bulbs have many cloves, not just a single row like hardnecks have. Some cloves are large, some small. They do not develop a scape so their stems stay soft and flexible, making them suitable for braiding. Be sure to purchase garlic for planting from a garlic farm, a reputable online source or your local farmers market. Grocery-store garlic is often treated with an anti-sprouting chemical to inhibit growth. It's a good idea to plant more than one variety as some may succumb to disease or won't perform as well as expected. By growing multiple varieties, you can hedge your bets and determine which varieties you want to plant in the future. 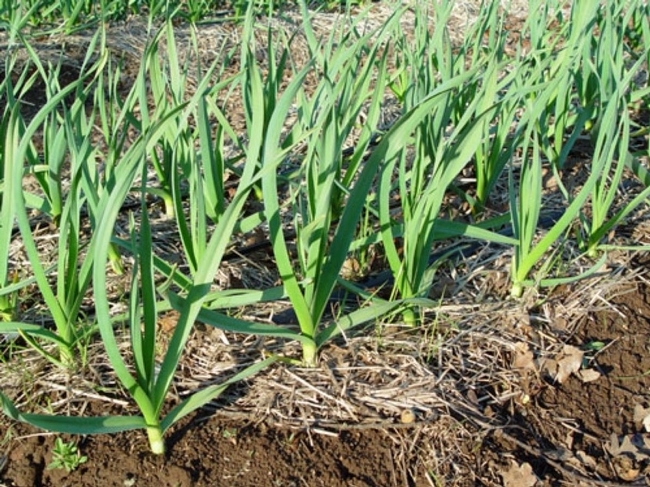 Garlic does best when planted between October 15 and February 15, but the earlier you plant, the better. The bulbs will have longer to grow and will be larger. 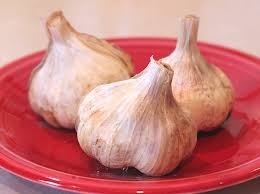 Plant garlic in a spot that you have not recently used for garlic or other plants from the onion family. The soil should be fertile, with good drainage. If water collects around the roots, they can rot or become diseased. A raised bed works well. Dig several inches of compost into the bed along with 10-10-10 fertilizer. Adding kelp meal will help bulb development. Plant in an area that gets at least eight hours of sun daily. 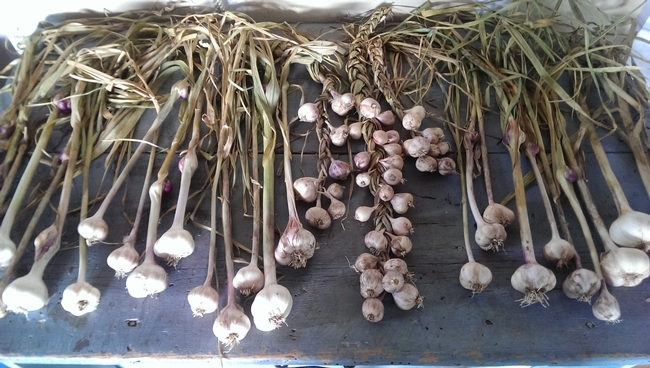 Planting garlic is relatively simple. Separate the bulb into cloves. Plant the cloves one to two inches deep, four to six inches apart and in rows one foot apart; be sure the pointed end of the clove is up. Firm the soil and water the bed. Cover with a layer of straw, chopped leaves or grass and you are done. When the leaves begin to grow, feed the plants with a teaspoon or two of a high-nitrogen fertilizer that decomposes slowly, such as blood meal. 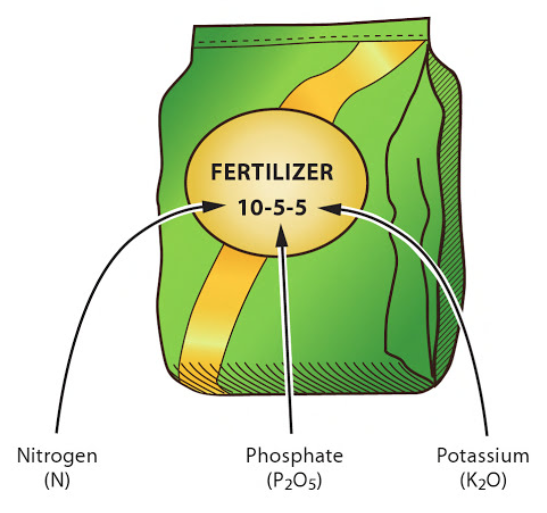 Work the fertilizer into the soil near each plant. You can also use a foliar spray of fish emulsion, if you prefer. Repeat every four weeks until the beginning of May. In June the garlic plants stop producing new leaves and begin to form bulbs. Once shoots emerge, water regularly until autumn rains start. If we have a dry winter, continue watering if you want large bulbs. Stop watering in May to allow the soil to dry out. 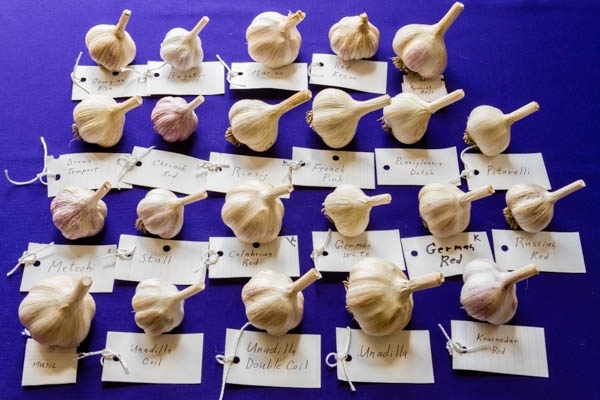 When I first started growing garlic, I followed the above guidance and planted over 20 varieties of hardnecks and softnecks. After the first harvest we hosted a tasting so that we could compare flavors. I continued to plant 20 or so varieties for a few years until I learned which varieties did best in our garden. This year I will plant Inchelium Red, Lorz Italian and Chet's Italian as all have been consistent producers. There you have it. Now get out there and order your seed garlic so that you can start planting in October.